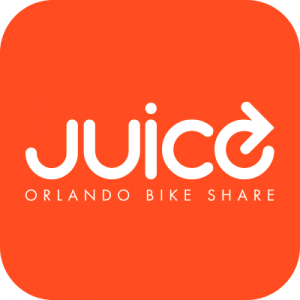 Central Florida isn’t just a great place for bicycling, it’s a great place for all kinds of water activities, too. I’ve been wanting to start kayaking again. I’ve owned a nice fiberglass touring kayak for 18 years, but it’s been stored in a friend’s shed for the last 8. It’s a great boat, but the seat is terribly uncomfortable and I’ve come to prefer the sit-on-top style for the kind of paddling I do. 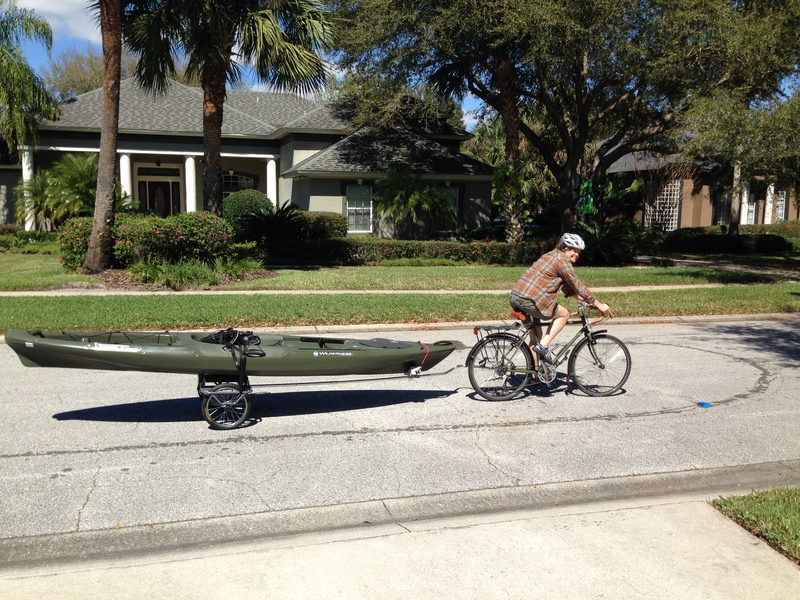 I decided to by a shorter boat so I could carry it by bike. For short trips, this is easier than lifting it on and off the car, and one person can load it alone, if necessary. 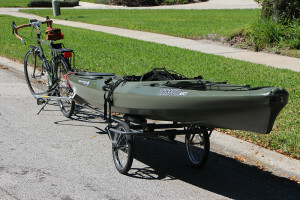 There are a number of bike trailers available for carrying boats. I chose the Paddleboy because it looked sturdy. I’m going to be pulling the boat farther than just to the end of the block. I prefer the hub hitch. I don’t think I have enough seat post above the frame for a seat-post hitch. I’m also concerned about having a hitch that could interfere with the cargo rack. 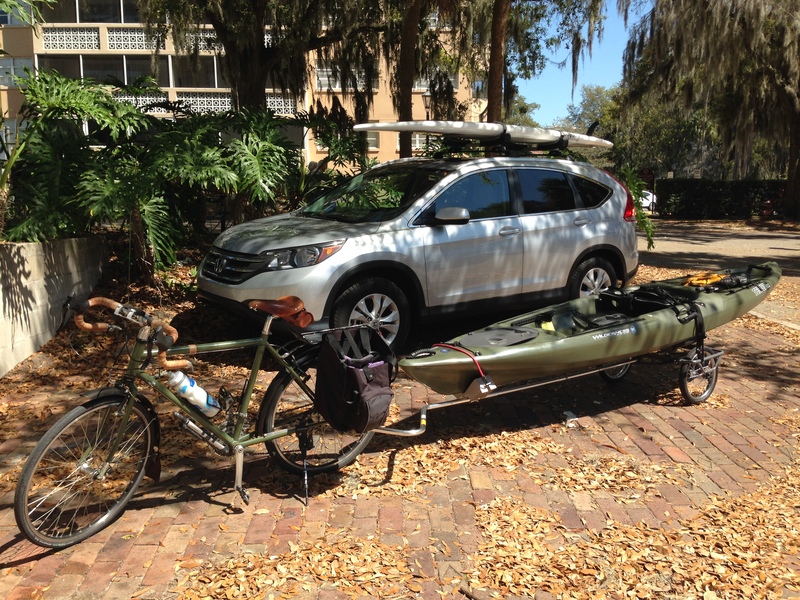 All my bikes have cargo racks. I got the trailer on Friday and put it together Saturday morning. I was not entirely impressed by the assembly instructions, but the product is excellent! It is as sturdy as it looks. It felt rock solid behind my LHT, never wobbled or swayed. The documentation says not to exceed 10mph, but I admit that I did on some downhill grades. I watched it in the mirror for any signs of instability and I saw none. And I felt none. I certainly felt the weight when going uphill, but on the flats it was light and easy to pull. As with any trailer, I think way ahead, corner slowly and don’t make any abrupt moves. Stopping that much weight in an emergency braking situation requires a lot more distance than just stopping the bike, so it’s important to ride in a way that won’t lead to an emergency stop. Yesterday was my first pedal/paddle adventure. 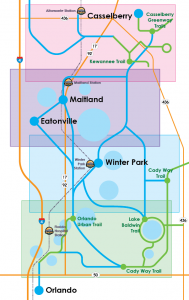 I mapped out distances to public launches in Winter Park and Maitland. Both turned out to be the same distance from home. Dinky Dock in Winter Park has a beach, and Lisa was paddleboarding, so that was the better option. 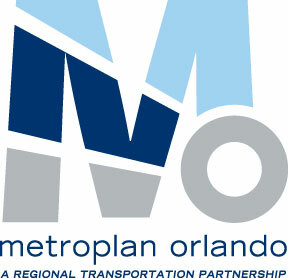 I have several routes to get to Winter Park, most involve some 2-lane roads. I thought it might be better to use 4-lane roads, so I headed out to Tuscawill Rd. The first mile or so of Tuscawilla Road has an annoying narrow shoulder (faux bike lane). It often has glass in it. The 12-mile trek was going to take long enough as it was; I didn’t need to be getting flat tires along the way. So I rode outside that space. That’s always a risk for generating incivility or LE problems, though, since motorists expect bicyclists to ride there and some Winter Springs PD officers have threatened to ticket bicyclists if they don’t ride in that shoulder. There was surprisingly a lot of traffic, but happily, no one fussed at me. I messed up and ended up getting in the wrong lane to cross Red Bug, a 4-lane cross street. But I was able to negotiate back into the right lane when I realized my mistake. I found myself in a nice big gap approaching the next intersection, Dike Rd., and was able to easily move out of the right lane, which drops there. But I got stopped at the light at Dike and it’s a ridiculously long one. A sizable platoon collected behind me there. The lane is too narrow to share just past that intersection and it’s slightly uphill. After the Willa Grove sub-dividion, the right lane becomes 14ft. In another 100ft or so there is a huge pile of spilled concrete obstructing the right 3ft, so I waited to move over until after I passed that. I don’t care for sharing 14ft lanes, especially when pulling a trailer, but I looked back and didn’t see any trucks in the line of cars behind me. I moved right as far as practicable, and waved to the driver behind me to pass. The line of cars, slowly and carefully passed me, giving me plenty of space. It was while I was sharing the lane and cars were passing that I heard the PA from a truck in the left lane. It don’t recall the exact words, but it was something like: “You need to get off the road, you’re obstructing traffic.” In my experience, a PA in an unmarked vehicle typically belongs to a law enforcement officer. The citation we defeated last November originated with a deputy in an unmarked SUV using her PA to command the bicyclist to get in the shoulder (which she incorrectly called a bike lane). I wished I had a PA so I could yell back to him that I am traffic. That pissed me off way more than uncivil motorist behavior would have. But I didn’t flinch and I kept both hands on the handlebars since any attempt to wave would’ve probably only included one finger. Aside from that, I only got honked at twice. Once farther south on Tuscawilla Rd. I was going downhill and had to control the lane at the speed I was riding. The driver of an Escalade blasted the horn as he passed easily, without any delay, in the left lane. And once more on Osceola Ave. on my way home. Considering the density of the platoons that overtook me, the amount of lane-shuffling in those platoons, the fact that I was passed safely by all of the motorists (well over 100, I’m sure), a couple of horn blasts is inconsequential. I wasn’t sure how difficult it would be to make the tight turn onto the Cross Seminole Trail from Tuscawilla Rd., and I knew I’d have to leave the trail again to make the crossover at Howell Branch/Hall Rd., so my original plan was to just take Aloma to Hall road and get on the Cady Way there. But the traffic volume on Tuscawilla Rd. and the prospect of encountering more law enforcement problems while avoiding the narrow, debris-strewn bike lane on Aloma changed my mind. I figured I could make the turn onto the trail if I started farther left. As I approached the entrance, I signaled my right turn, then turned around and signaled that I was slowing and moving left. The car behind me slowed and I was easily able to move to the left tire track to start my turn. Plenty of clearance. I always have to use some portion of Tuscawilla Rd. to get to the Cross Seminole. It’s a wonderful feeling to enter that tree canopy and get away from the noise. How could I have considered going any other way? The Cady Way bridge over Semoran Blvd. made me grateful for a granny gear I don’t otherwise use around town. But the climb was more than worth the enjoyment of being able to use the path. Especially since I was fighting an ugly headwind the whole way. 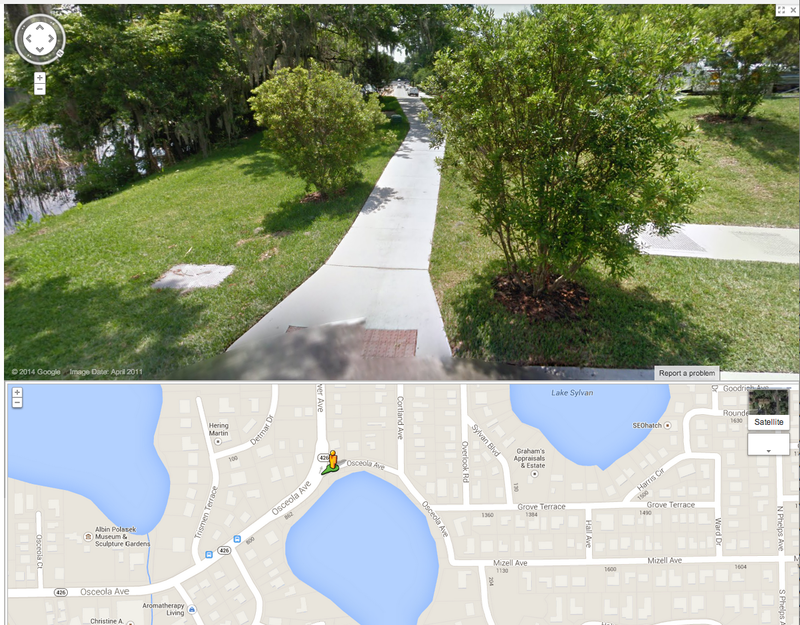 Because of the lakes, there is no reasonable way to get from Cady Way to Dinky Dock without using Aloma/Osceola Ave. That’s the downside of enjoying Cady Way to come to Winter Park. Many bicyclists (myself included) take Mizell Ave. all the way to Lake Mizell, then use a sidewalk extension to access the sidewalk on Osceola Ave. There is no curb cut there, so once you get to Aloma, you have to ride on the sidewalk at least as far as the first driveway. I typically only use that route when heading east and I get onto the sidewalk at that driveway. The sidewalk is obstructed by utility poles, then runs along a wall. It’s only wide enough for one bicyclist at a time. It was definitely not an option with the trailer, so I turned left on Aloma at Phelps and controlled the right lane through the dreaded Brewer/Osceola curves. I had very little traffic at first, but eventually the light at Lakemont released a huge platoon. They caught me before the curve (probably good since that meant no one would come flying around the corner only to find me there). But the traffic was so dense, it was difficult for people to change lanes. Fortunately, everyone was polite. Once the downhill grade started, I picked up enough speed that I was riding close to the speed of traffic in the left lane. As I was passing the end of Lake Mizelle, I saw a gap in the left lane and decided to change lanes. I didn’t remember that there is an uphill grade between there and Ollie Ave. In retrospect the lane change was probably a bit early, but no harm was done. I was getting tired and really hungry by the time I slogged up that last grade and was very happy to have arrived at Dinky Dock where Lisa was waiting with lunch. It was fun to get out on the water again, too. The trip home was very good. I was dreading it a bit just because it’s such a long distance to be hauling 90+lbs of boat, gear & trailer. But the tailwind on Cady Way offered a welcome push. As I mentioned, I got an obligatory horn blast from someone on Osceola as I was climbing up the curve. Whatever. I’m sure the motorists who had to wait a few seconds to pass were reunited at the next red light with the ones who didn’t. Nonetheless, I would have really appreciated a curb cut for that sidewalk extension to Mizell. I decided to take Gabriella and Brooks instead of Tuscawilla, even though they are 2-lane roads. That turned out to be a much better route decision than the one I’d chosen on the way out. I was passed politely with maximum clearance by everyone on the 2-lane roads. I did a little bit of control & release when there was oncoming traffic and everyone was cooperative and polite. And I was cheered on by a flock of turkeys that lined up along the fence of one of the farms I passed. I rode almost 25 miles with the boat yesterday. More time pedaling than paddling. It was a fun adventure but that is a bit too far for regular use. I think 5 or 6 miles each way may be a more realistic distance for transporting the boat by bike. But it’s definitely an awesome way to get the bike to the water! Way to go Keri! Very cool. That was a lot of thinking you had to do beforehand and enroute about how to best travel with the canoe, merging with traffic, etc. You must have been wiped out when you finally got back home. Nice adventure day. Way to go! Perhaps the 10mph limit recommendation is based more on stopping than on straight line stability. The boat I’m hauling is 3ft shorter than the max size and it was very well balanced on the trailer. But if the road was rough, I could definitely see instability issues. And yeah, for braking, I would not exceed 10mph in a context where a quick stop could be necessary.